We had watched the pilot episode of The Magicians some time back and we were more amused by it than fascinated and parked it for later viewing in favor of those shows we had a stronger interest in. Eventually I doubled back and figured that I might as well trying watching it as iflix had a content deal with included the three seasons of the show. The irony was that when I started watching then series the app started flashing that the first season was going to be removed from the library in about a week so I really had to rush going through it. The show is in a broad sense an adult version of Harry Potter as you have people with magical potential being invited to a post-graduate program where they can learn magic. So it's not simply a school for magic but it is a university dedicated to it. And so their problems can still sort of like Harry Potter but with a more adult flavor to things and thus much bigger stakes without needing to resort to a big bad without a nose. 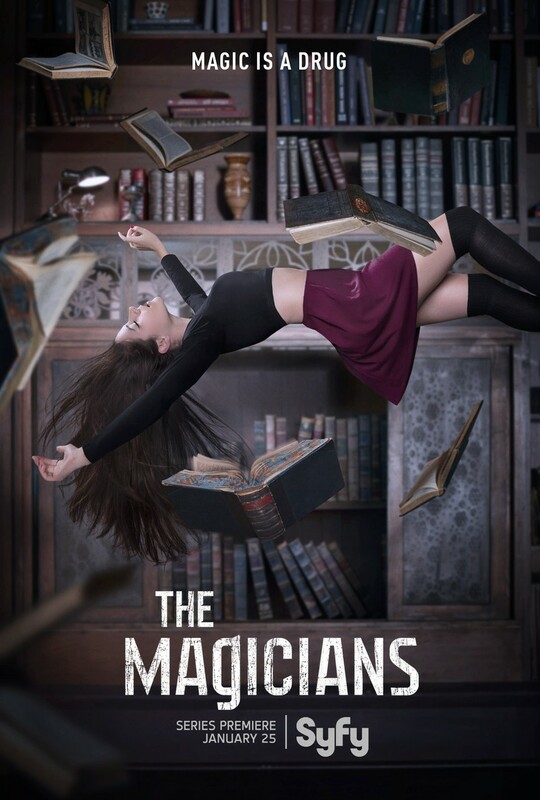 Synopsis: The Magicians is an American fantasy television series created by Sera Gamble and John McNamara. The show is largely based on the novel of the same name written by Lev Grossman. The show really begins when Quentin Coldwater (Jason Ralph) and his friend Julia Wicker (Stella Maeve) are somehow invited to apply at the secret Brakebills University for Magical Pedagogy. Quentin is accepted into Brakebills but Julia is not, much to her resentment. Her memory of the entrance exam is supposed to have been erased but eventually she manages to remember everything. One of the key revelations for Quentin when he starts his post graduate studies at Brakebills is the fact that the land of Fillory, the subject of a book series that he had loved since childhood, turns out to be a real place. Unfortunately, it also seems like Fillory is nothing like what he had learned off in the books and Quentin's early days at Brakebills involves a threat that may somehow be tied to Fillory as well. What I Liked: As oddly elaborate as it seems, there is something strikingly intriguing about their brand of magic with all its elaborate hand gestures and spell circles. It's magic steeped in ritual, which makes for a nice university feel that goes a little beyond just saying things in Latin. And then there's the fact that their system of magic has different disciplines or fields of study based on the sort of magic that they can perform. I also love the layering where Fillory is obviously a reference to stories like the Chronicles of Narnia and yet twisted to be something darker. It's a brilliant subversion of the genre and one that ties into the larger narrative to a great degree and in a very satisfying way. What Could Have Been Better: It's really hard to get on board with Quentin as a protagonist as his sickly appearance and near constant need to brush hair out of his face sells the concept of him as a social loser but is very annoying over time and it's hard to respect him as a character. Almost every other character in the show is more interesting that he is. In terms of the "Physical Kids", I suppose Alice Quinn (Olivia Taylor Dudley) is a suitable enough companion for Quentin as she's a Hermione-type character taken to the extreme and that's really annoying. The two together try to drive the story forward as best as they can but sometimes you don't want to follow. TL;DR: The first season of The Magicians is a little rougher than I expected and it was hard to appreciate how the show managed to get to three seasons based on the first season alone. But there were definitely great things to build a larger narrative around especially after the season finale. Thus the season gets a good 3 complicated magical hand gestures out of a possible 5.